I’ve been having a play with alcohol…inks again! This time though I have been experimenting with simple keeping things a little more simple. The white cardstock underneath has some basic inking around the edges with some fern leaves randomly stamped around the edge. 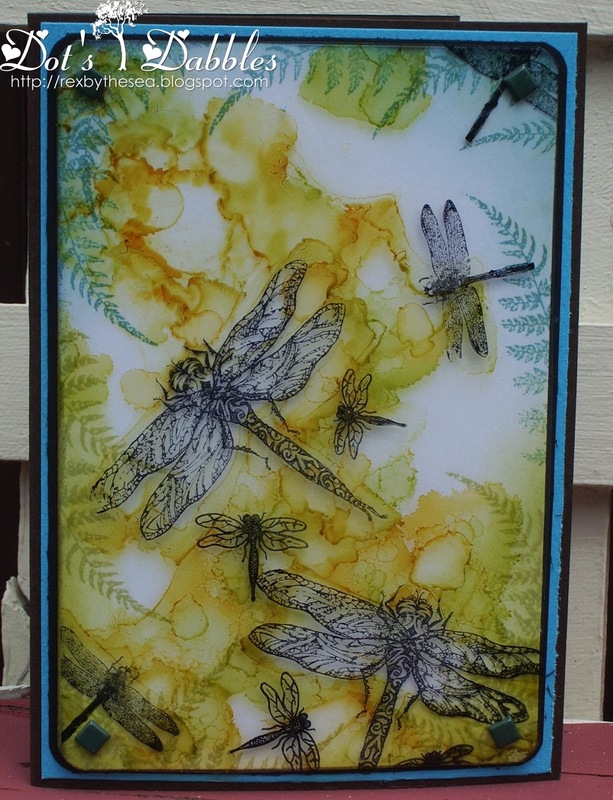 and then alcohol inks on the other side…I used the solution to wipe away the colour from the dragonflies so that they stood out a little more. I simply love the coloring, and the dragonflies are really decorative. Fabulous, so beautiful…Thanks for joining us at Divas by Design this week. Hi Dot, I love how you create something amazing when you play with alcohol inks! This is fabulous! Wow, such a fabulous card, the background is perfect for the wonderful dragonflies. I thought I had commented on this beauty, but maybe on FB! Love how dreamy the effect is that you created in that background! Such a lovely floating feeling! Dot, this is crazy beautiful! I love what you've done with the AIs… gorgeous!